Add notes of grace and elegance to your garden, yard or just about anywhere else outside with the Western Red Cedar Wood Garden Arbor and Rose Trellis from Cedarwood Furniture. This cedar garden trellis boasts a gracefully curving cedar arbor arch and a traditional rose trellis that can also accommodate grapes and other vines and climbers. Made in Canada of unfinished natural-grain tight-knot Western red cedar, it stands 82 inches tall.  #AQ19 - 3' Arbor Dimensions: 42"W x 24"Deep x 82"H. (36" inside width) 38-lbs.  #AQ16 - 4' Arbor Dimensions: 56"W x 24"Deep x 82"H. (48" inside width) 41-lbs. 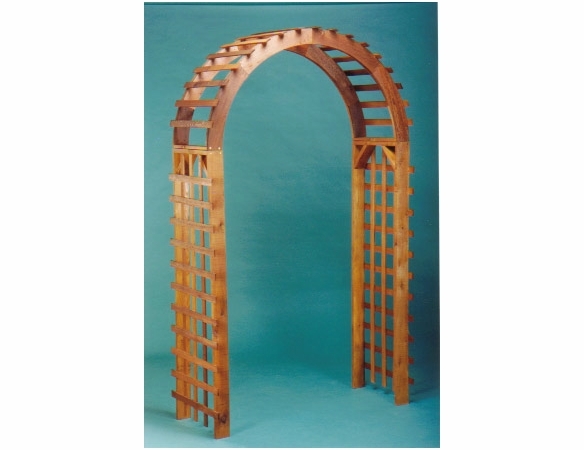  Lattice slats 3/4" x 1-1/2", Begin 2" up from bottom, Post Legs 15/16" x 3-1/2" x 64"H.
For a similar arbor see the Cedar Garden Arch, or navigate back to the Garden Arbors page to view our full collection. Weight: 3' - 38 Lbs.